I have kids. I love kids. But even I get sick of seeing them sometimes, especially when it seems like they're taking over Facebook. 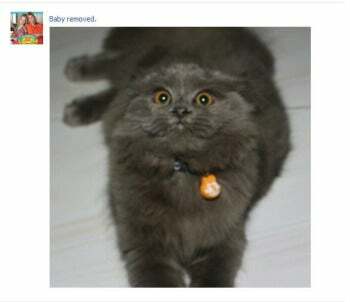 That's why I like Unbaby.me, a Google Chrome and Firefox extension that turns your Facebook news feed into a baby-free zone. Why look at someone's cute kid when you can see this big, fat cat instead? Unbaby.me gives you the choice. Unbaby.me finds pictures of babies in your Facebook news feed and replaces them with whatever you want, which it dubs "awesome stuff." The "awesome stuff" that Unbaby.me replaces the baby photos with is up to you. It works by looking for keywords likely to be associated with baby photos. Unbaby.me comes loaded with its own set of keywords, which include everything from "year old" and "so adorable" to "birth" and "ultrasound." This keyword list is accessible via Unbaby.me's configuration page, and you can add to it as you see fit. And you'll want to: When I tested Unbaby.me using only its suggested keywords, it only blocked about half of the baby photos on my news feed. When I added a few more keywords, such as the names of my friends' little bundles of joy, the results were far more comprehensive. You add a link to your favorite image-based RSS or an Instagram feed, and Unbaby.me will pull pictures from it to replace the shiny happy baby photos. If you don't have a favorite image-based RSS, you can use the default option, which uses pictures of cats, or you can search by a keyword such as "bacon" or "food." The results are amusing, to say the least. Instead of a smiling baby peering up at you from your Facebook newsfeed, you can see a cute kitty. Or a big tub of bacon. Or whatever you prefer. And your friends will never know that you've blocked all pictures of their precious offspring. The biggest problem with Unbaby.me is that it's limited to Firefox, Google Chrome, and your Facebook newsfeed. If only it could work in fancy restaurants and on airplanes, then we'd all have something to celebrate. The biggest problem with Unbaby.me is that it's limited to Firefox, Google Chrome and your Facebook newsfeed.